“Now that we have established that fact can we now move on to something else? Like my upcoming wedding? He said he wants the wedding done as soon as possible so we can head to the states.” Even as Biola spoke she could hear the excitement in her voice. She was lucky to have met Fred when she did. He was the man for her. The man who could meet all her needs and wants. Their meeting hadn’t been totally coincidental ’cause when Gloria had mentioned him she had done everything she could to make sure they bumped into eachother and the rest was history. Love for him wasn’t involved yet. She recalled how many times she affirmed his love with words but deep in her heart she didn’t mean it. She felt guilty having lied to both her friend and Fred. She wasn’t with him for the reasons he thought. But it didn’t matter. He didn’t have to know. . . No one did. We would all have various answers to this question. 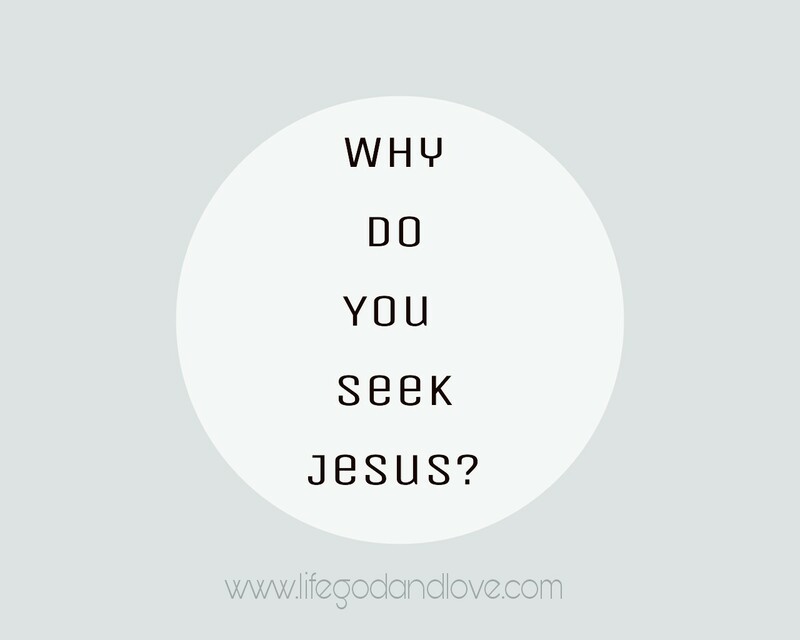 We all seek Jesus for different reasons. We want a new job, we call on Him. We need to pay our rent. We need money. We want healing for ourselves or a loved one. We want food. We want to get better at our ministry; the work He has called us to do . . We call on Him. All these and more. We call on Jesus because we have a need or a want. But are those reasons alone good enough to seek Him out? He knows our motives. Yes, they may be pressing matters that require urgent attention, but afterwards do we seek for a deeper relationship or we just treat Him like He’s an ATM machine that we go to when necessary? I must have written about my wanting to seek God out because of the stories I write. It’s all good but is my relationship with Him deepening? Whatever you’re seeking God out for right now is only temporal. It’s only for the now. Our period here on earth. But what about eternity? Are you building a relationship with Him that would last forever? John 6:24-25 KJV, “24When the people therefore saw that Jesus was not there, neither his disciples, they also took shipping, and came to Capernaum, seeking for Jesus. They actually travelled all the way to meet Jesus. Gone through all that stress, which is commendable, but all for the wrong reasons. They wanted what He could do for them more than they wanted Him. The people came looking for Jesus because of what He could give them and not because they desired any spiritual nourishment or because they wanted to be saved. They just wanted to be physically filled. If we are sincere with ourselves and search deeply within us, are we seeking God out for the right reasons? So what should we seek for? Therefore if you have been raised with Christ [to a new life, sharing in His resurrection from the dead], keep seeking the things that are above, where Christ is, seated at the right hand of God. Set your mind and keep focused habitually on the things above [the heavenly things], not on things that are on the earth [which have only temporal value]. For you died [to this world], and your [new, real] life is hidden with Christ in God. Moses knew to seek God for the right reasons. Now therefore, I pray you, if I have found favor in Your sight, let me know Your ways so that I may know You [becoming more deeply and intimately acquainted with You, recognizing and understanding Your ways more clearly] and that I may find grace and favor in Your sight. And consider also, that this nation is Your people.” And the Lord said, “My presence shall go with you, and I will give you rest [by bringing you and the people into the promised land].” And Moses said to Him, “If Your presence does not go [with me], do not lead us up from here. Moses said a prayer to God, asking to know His ways. To grow closer to Him and not just be an ordinary servant doing WORKS for Him. And God granted him that request. Psalms 103:7 KJV, He made known his ways unto Moses, his acts unto the children of Israel. Nothing stops us from seeking God and wanting a relationship with Him. Whatever excuse we may have is really what it is. . . An excuse. “If God gives such attention to the appearance of wildflowers—most of which are never even seen—don’t you think he’ll attend to you, take pride in you, do his best for you? What I’m trying to do here is to get you to relax, to not be so preoccupied with getting , so you can respond to God’s giving . People who don’t know God and the way he works fuss over these things, but you know both God and how he works. Steep your life in God-reality, God-initiative, God-provisions. Don’t worry about missing out. You’ll find all your everyday human concerns will be met. “Give your entire attention to what God is doing right now, and don’t get worked up about what may or may not happen tomorrow. God will help you deal with whatever hard things come up when the time comes. Thanks so much for this, it came at the right time. GOD bless you and your family beyond your greatest desire or wonder in LORD JESUS Name. Amen. Thank God😊 Amen! God bless you too sis.